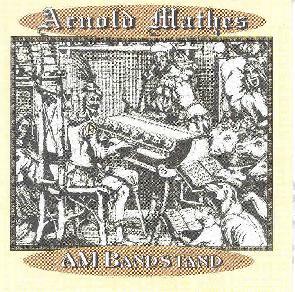 Arnold Mathes - "AM Bandstand"
Arnold Mathes is a veteran of the 80's cassette scene, and did a stint with Alien Planetscapes. Armed with a vast array of keyboards and synthesizers, Mathes explores just about every kind of instrumental electronic music you can imagine on AM Bandstand. The Moon Pool is a marching, symphonic piece with classical influences, in the tradition of Vangelis. Not one to get in a rut though, Mathes follows that with Hither and Thither, something that sounds like the sort of bouncy, melodic stuff Tangerine Dream was doing in the 80's. Immersion, on the other hand, is a spacey ballad, again in the Vangelis style. You get the idea that he has quite a few influences he's drawing on. Take, for example, This Infernal Machine, which sounds like a cross between Eat Static and Larry Fast! Organism, on the other hand, is a stately organ piece, complete with peals of church bells near the end just before it segues into AMPOP, which, contrary to its title, is a moody Tangerine Dreamish piece, reminiscent of some of their 80's soundtrack work. The New Rage goes straight for the experimental, with a weird martial rhythm and blasts of horn-like sounds punctuated with laughter and wails! Mathes delves deep into Larry Fast territory again with the symphonic The Grand High Exalted Mystic Ruler. The Eternal Gardens is pure deep space ambience, leading into the moody ManaPrana, a psychedelic East Indian freakout with synthesized sitars and tablas! It's back to the 80's TD for Analogo, a tick-tocking little number with an eccentric melody, followed by the brief symphonic ambience of Tetenwelt (World of the Dead) and the 10-minute Ebb & Flow, a dreamy, jazzy night time journey. The album closes with the short but almost funky-sounding Terminated. Mathes takes the listener pretty much all over the electronic map, and while I enjoyed it all, I always got the feeling like I had heard it somewhere before. It didn't make the journey any less enjoyable, but as someone who is familiar with a lot of electronic music (especially from the 80's, which seems to be Mathes' primary decade of influence), it did have a bit of that "been there, done that" feel, for me anyway. If you're not so familiar with it all, and want to taste a wide variety of styles in electronic music, this album will definitely get you going.